This is the time of year when we thank God for small pleasures as well as big blessings in our lives. And I thank God for this wonderful scented candle I have found. It is Cinnamon Pecan Swirl! Our love affair began on Thanksgiving morning. I was coming home from church and I detoured to CVS. I am getting a kick out of CVS. They have all these specials and whenever you buy anything they give you a receipt a mile long -- that is to say, as long as this sentence -- and on the back of the receipt is an array of coupons, and the coupons are good only for three days so you have to go back soon and buy something else. Anyway. I was supposed to have been home starting to roast that turkey but instead I was wandering the aisles of CVS. And they had these candles marked down from $10 to three for $10. You could not beat that! They were 18 ounce candles, squat and wide and in glass jars so Howard would not get mad at me if I lit one. The brand was Candle-Lite which, now that I read about it, I see goes back to 1840. How about that? Robert Schumann could have bought a Candle-Lite candle. There were a bunch of fragrances and I did not have time to stand there sniffing all of them which, to be honest, I could do that for hours. I am not proud of my ability to waste time. But on Thanksgiving I was in a hurry so I bought six, all different. Pine, Cinnamon Apple, Black Cherry, Pumpkin Nutmeg Pie and Cinnamon Pecan Swirl. We did light three of the candles on the Thanksgiving table and they survived the dinner and so did the house, although we had a couple of close calls. That is not our family in the picture up above, I will say that right now. I got that picture from the Candle-Lite Web site. 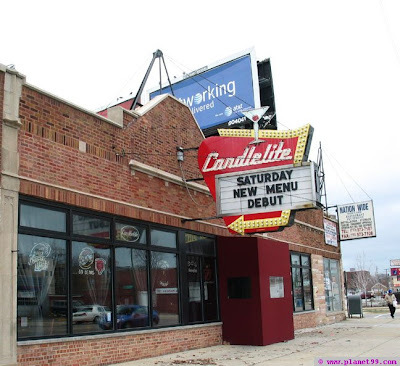 What about the Candlelite tavern in Chicago? Would that I were going there today instead of to work! Back to my Cinnamon Pecan Swirl candle. Since Thanksgiving I began realizing that whenever I passed it, I had to pick it up and take a whiff. I even made my brother George sniff it. George like most guys is not much for scents or candles but even he loved it and acknowledged its supremacy. "Don't burn it," he said. "You might ruin it." Would that we could do Scratch 'n Sniff on this Web log! Would that we had Smell-o-Vision! But alas, we do not. So you just have to use your imagination when I tell you that the other day, when our storm was kicking in, I took time out of the storm to detour to three different CVS's hoping to find more Cinnamon Pecan Swirl candles! They had since risen in price to $5. But I had a coupon for $5 off a $15 purchase. Zut alors, I could find no Cinnamon Pecan Swirl! The CVS by Goldman Motors had Pumpkin Nutmeg Pie which was close, but, and George had agreed with me on this, not quite as good. The palatial CVS at Harlem and Kensington near my mom had the Vanilla Spice which was also not quite as good. This Cinnamon Pecan Swirl, it is the Leonard Pennario of candles. Other candles can be good but they are missing that certain something. Late that night, on the way home from my mom's, I thought, one more CVS would not hurt. So I stopped at the CVS on Hertel. The night was becoming surreal with howling winds and blowing snow. The clerk looked oddly glassy-eyed. It crossed my mind that maybe I was dead. Maybe it was like this movie "Carnival of Souls" and I was dead and I did not realize it. Nevertheless I was going to go look for this candle! I found my way to the display. And there it was. Cinnamon-Pecan Swirl! There were three of them, too! The exact number I wanted! The little things that can make your day. Sounds like a 'Cinnamon Pecan Swirl' kind of blessing to me. Not much of fragrances but I do know two. 1. Gardenia flowers smell good to me. I used to have on of those plants back in the early 60s. 2. While in the local woods (Great Dismal Swamp) one time, I discovered a wonderful spring treat. A vine like honeysuckles that had wonderful smelling little yellow flowers. I even put a hank of them in my car! Turns out they were Yellow Jasmine'.So nice! BTW, winter must officially be here now. Last night it got down to 28F! Coldest temp yet! And... I am not sure, but, I think I may have seen a flakule of snow!!! I actually found your blog because I was google-ing cinnamon pecan swirl candles! I too have fallen in love with this candle and have been on my own quest to find more...A particular Kmart in a dicey part of town has had them the three times I went in looking - of course the candles left with me - but now, thanks to you, I shall check CVS as well! I've gone so far as to save all the melted wax I could so that perhaps if wicks can be found, new candles can be made from it...Ahhhhhhh, yes, what a fantastic scent! Wow, I love that last comment! And Larry's too ... I wish I had seen them before. Anonymous, I hope you are still enjoying your Cinnamon Pecan Candles. I know I am enjoying mine!